Accumulator - Horizontal Tape | Tensor Machinery Ltd. There are a few different types of tape accumulators designed for various metal tapes. The type of accumulator required depends on the application. The Horizontal Festooning Tape Accumulator is designed for corrugated tape and is typically placed after the corrugator. Up to 100 meters of corrugated tape can be held by the accumulator. Using diverting rollers that redirect the tape, the accumulator can be placed at 90 degrees to the line. 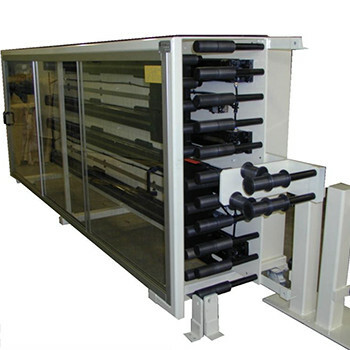 This accumulator is designed with pneumatic cylinders that move the carriage and apply the tape tension. The air pressure is controlled manually or from a controllable pressure regulator connected to a PLC. During a tape splice, the corrugator is stopped and the accumulator gives off its tape under a controlled tension. When the splice is completed, the corrugator starts up and feeds the tape into the accumulator. • Provides constant tape tension during and after tape splice. • Allows for the processing of narrow tapes. • Improves safety with push-button operation. Operator never has to touch the tape during operation. • Reduces scrap. Tape is always accumulated; therefore, the exact end of the tape pad can be spliced.